The Amperis MMF-ASR battery rectifier has the most efficient technology available. It has a robust and reliable design for industrial applications, with the advantage of easy access and maintenance on site. It is a universal charger valid for all types of batteries (multivoltage, multi-layer and multi-chemical): vented lead acid, VRLA (regulated lead acid with valve) or nickel cadmium. It can also be used as a power source without batteries. The great advantage is that it has a complete set of standard load curves programmed in the factory with the possibility of creating and saving customized load curves. The control boards of the MMF-ASR are based on state-of-the-art microprocessors. The charger / refueller is based on the standardized technologies of SCR and IGBT power converters. THE MMF-ASR CHARGER IS A RECTIFIER SYSTEM THAT COMBINES THE VERSATILITY OF THE MMF CHARGER WITH THE BENEFITS OF THE ASR RECTIFIER. 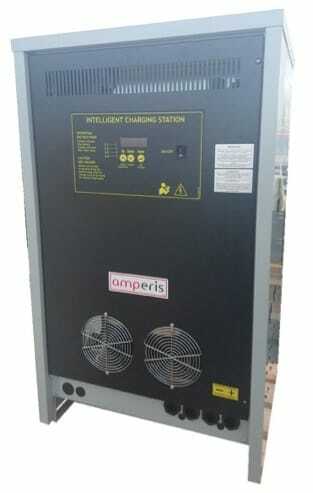 The Amperis MMF charger is a universal, programmable and digitally controlled charger. It can work with batteries of any kind and support applications of any kind (Training, Conditioning, Recovery, Desulfation and Regeneration). It has a very complete set of load curves (the user can program new curves). The Amperis ASR battery rectifier is designed to power critical loads in DC or to charge any type of batteries. It is based on the standardized technologies of IGBT and SCR power converters (in 6/12 pulse configuration), which guarantees high reliability and efficiency. It is based on a new power conversion technology, which combines very high efficiency, unit power factor (PFC), universal capacities and precise load control. The MMF-ASR ensures a minimum temperature rise in the battery during the recharging process, thanks to the ultrafiltered output current (perfectly constant load current and zero ripple). It has an output blocking diode for parallel capacity, double output connectors and an LC output filter. The convection cooling system of the power stage is designed to work 24 hours a day. Submersible probe for the temperature of the battery. Box type IP54 or NEMA 3R. Extended data logger with miniUSB or Bluetooth port. Output block diode (for parallel operation).Switch for charging. Monitoring of ground faults, alarms and cooling system. Redundant power for the control boards.